“Personhood” is the concept at the center of “Unlocking the Cage,” a new work by iconic documentary filmmakers D.A. Pennebaker and Chris Hegedus. From a legal perspective, are there cases in which animals can be considered persons with rights that might include not being confined in cruel or onerous circumstances? In the past it was assumed that persons were individual human beings. But then came the Citizens United case, where the personhood of corporations was affirmed. Might the definition be expanded to include certain non-human, non-corporate individual beings? The fight for animal rights has been a growing movement in recent decades, one with many fronts and expressions, from principled vegetarianism to protests against scientific experimentation on animals. “Unlocking the Cage” focuses on the U.S. legal front and one intrepid animal advocate in particular. From his home in Florida, attorney Steven Wise recalls that he had a standard practice for a young lawyer back in 1979 when someone gave him the book that changed his life, Peter Singer’s “Animal Liberation.” Deciding he could do much more good in his life trying to defend a whole species rather than individual human miscreants, he dedicated his career to making the case that non-humans should have rights under the law. It was not easygoing, especially early on. “People laughed at me,” he recalls. “They barked when I went into a courtroom.” But Wise’s persistence eventually produced results. In 2000, he began to teach a course on the subject at Harvard. 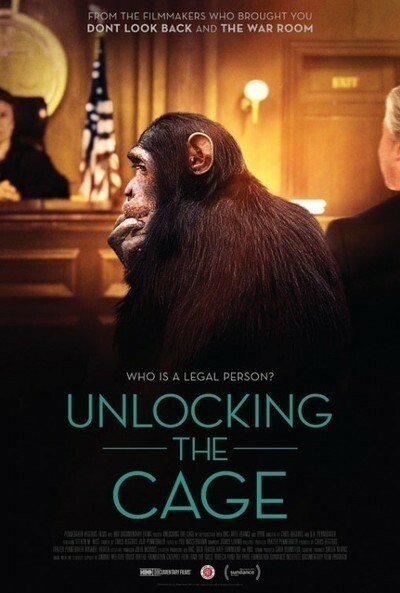 “Unlocking the Cage” follows Wise and his colleagues in the Nonhuman Rights Project over about three years as they push cases regarding individual animals through the courts of New York state. Attempting to give his efforts certain boundaries that will make them more effective, he generally focuses his arguments on three types of non-humans—great apes, elephants and cetaceans. These have all been studied and determined to have highly developed cognitive abilities and awareness of themselves and their environments. Wise says that each has a “theory of mind,” the meaning of which is rather murky even if his intent is clear. From both legal and publicity standpoints, these three non-human groups also have the advantages of not residing in the United States or figuring into the diets of its (human) denizens. In any event it’s only apes that figure into the cases before New York’s courts in “Unlocking the Cage.” We see Wise and his colleagues going around the state and looking at apes in different circumstances. Some are in protected sanctuaries where they demonstrate sometimes quite astonishing abilities to reason, remember and communicate with their human keepers. Others, though, are apparently being kept just for the sake of being kept and exhibited (or possibly, used for experiments); it’s these non-humans that Wise builds court cases around. We see several of his appearances in front of judges making his arguments, and it must be said these are no more scintillating or full of high drama than most courtroom procedurals. All the same, there’s import and interest not only in how careful, respectful and scrupulous most of the judges seem but also in how gradual and painstakingly incremental the animal advocates’ strategy is. They’re arguing about individual animals, apes with names like Merlin and Koko, but their real aim is to gain legal personhood for animals—at least certain kinds, as a start. And in the course of the film, we see them make some small but important steps toward that goal. Where will this lead? When Wise appears on his show, Stephen Colbert wonders if his dog will soon be suing to get on this couch. The idea that an ape can be granted habeas corpus—as the film shows, similar cases are afoot in other parts of the world—generates all sorts of mirth, derisive and otherwise. When he’s asked if all of this could end up in a cow successfully suing not to be slaughtered, Wise says this might come only generations after his own lifetime, but he wouldn’t be unhappy if it eventually happened. Of course, as its title suggests, “Unlocking the Cage” is a kind of advocacy journalism, not an attempt to weigh the cons as well as the pros of whether non-humans should have human-like rights. But the film will surely have its own role to play in the arena that perhaps counts most: the court of public opinion. Polls show that public views of animal rights have also been evolving in recent years. Wise, obviously, has reasons for optimism. At least they’re no longer barking at him.